My goal is to walk from the mouth to the source of the Derwent River in Stages. I propose to reach and leave each Stage by using a public bus. There are 4 general public bus services in southern Tasmania (as distinct from those which can be chartered in various areas). One is for the metropolitan Greater Hobart Area (Metro), one is for New Norfolk and other nearby towns (Derwent Valley Link), and the other two (Tassie Link and Redline) are for regions further afield. On my walk from the mouth of the Derwent River on the eastern shore to the Bridgewater Bridge and back to the mouth of the Derwent on the western shore, the Metro bus service has deposited me near starting points and collected me from finishing points of each Stage. From the Bridgewater Bridge west and northwards the Metro bus service does not operate. Instead I have used both Derwent Valley Link and Tassie Link services to continue my walk to and from the source of the Derwent River at Lake St Clair. Using my experience here are some tips not all of which are written and published by the bus company which should be useful for tourists, and for locals who do not normally use the Metro bus service. Throughout my posts covering the early walk stages in the Greater Hobart Area, sometimes I gave very specific information about route names, numbers and timetables. Please note that such information can no longer be relied upon. Since then Metro Tas has made dramatic changes to their services. Therefore, I strongly recommend you check their bus line’s website for up-to -date and accurate information. Half way along Hobart’s Elizabeth St bus mall, a Metro shop is open 8am to 6 pm Monday to Friday. During the period when Tasmania practices daylight savings time, the Metro Shop is also open 9.30 am to 2pm Saturdays. The shop has walls loaded with free bus schedules for you to collect. In addition, the shop is staffed with people who can answer your questions and help you to work out which buses, when and where. The staff can advise you on the cost of bus fares and the various ways to attract discounted fares. Only two options are available: pay by cash as you get onto the bus, or obtain a Greencard. If you get a Greencard at the Metro shop or with an online application, and put some bus fare money onto this, then every time you ride a bus, you place your card on a device near the bus driver and your fare is deducted automatically – however, the price charged is 20% less than the normal bus fare. And the day’s fares are capped at a maximum amount. The other advantage of the Greencard is that you don’t have to worry about having correct or near correct cash with you. The dollar values are determined by the distance and location where you will be travelling, and your status (child, concession holder, seniors, no concession). On a pole at road side edges, a metal rectangle proclaims that is a bus stop. Most but not all bus stops have timetable schedules posted either on a pole sign or in a passenger shelter close by. Note that most, but not all, posted schedules are current. Even if you are standing at a designated bus stop looking expectantly at an approaching bus, unless you signal that you want the driver to stop they are within their rights to drive on by. It doesn’t matter how silly I feel, I always hold my arm out fully extended and horizontal to the ground. I have never experienced a driver not stopping for me. Be careful if you wait in a passenger shelter – be alert so you do not fail to see a bus on its way to the stop and then fail to signal. Be aware that other people waiting at the stop might advise you not to bother signalling – ‘they always stop’ . You should know that drivers do not have to stop unless you signal. Most do, but they are not obliged to do so. All Metro buses have buttons throughout the bus, which you press to signal to the driver you want the bus to stop at the next bus stop. Drivers will be very annoyed if you don’t give them time to move the bus into the correct lane and stop without causing an accident or traffic rage – that makes sense to me. If you are unsure where you are getting off, or you feel like you won’t see a landmark or bus stop in time to press the button, you should say as much to the driver when you first get on. Have a range of information in your head ready to tell the driver so s/he can get a better idea the stop location that you are talking about. This is because drivers will not always know the names and location of every street in Hobart. Even when I ask the driver to let me know when we have reached a stop and to stop there to let me off, I am vigilant just in case the driver is distracted and forgets me. Forgetfulness hasn’t happened but I know that it’s my responsibility to make my own way and so I do everything I can to make sure I get off where I need to. Buses do not always arrive at the time given on the posted timetable schedules. This means, that as long as you are at a bus stop approximately 5 minutes before a scheduled arrival, you may be waiting anything up to 20 or so minutes more. This length of wait doesn’t happen often in my experience. In fact, most buses arrive on time or arrive only up to 5 minutes after the scheduled time. The reasons for the delay are simple and easy to understand (although not all bussing locals do understand). Buses have been caught in motor vehicle traffic and delayed unexpectedly. More passengers have needed to get off the bus than usual. More passengers have been waiting to get on at bus stops than usual. More mothers with prams and strollers or people with wheel chairs have taken time to get on or off. When a ship passes under the Tasman Bridge no vehicular traffic is allowed on the Bridge and can create a wait of 10 minutes or so. So my message is NOT TO WORRY AND FRET if a bus is late. Only once in my walks along the Derwent River have I phoned Metro, after waiting half an hour, to find out whether the bus was actually coming. Unfortunately, there had been an unexpected mechanical problem and another bus had to be brought into service. This is what happens in real life and I felt the service was fine, all things considered. Buses do not always leave at the time given on the posted timetable schedules. Very few buses leave more than a minute or two before the advertised departure times. But since some do leave earlier than you expect, it is important to be waiting at a stop five minutes before the departure time. I was once informed that all the drivers and their buses take their time from a depot clock. I am mindful that my watch, mobile or clocks around the city may be set to another time and that I shouldn’t depend on the bus times to be in sync with other time keeping devices. From time to time you will reach a bus stop just as the driver shuts the bus doors. Drivers are instructed to keep to timetable and once s/he has shut the door, then s/he is deemed to have started the departure and does not have to reopen the door (however desperate you seem). You can stand there looking hopeful and sometimes a driver will have pity on you. But this doesn’t always happen. Be philosophical and wait for the next bus or make other plans. Metro employs both male and female drivers. Some have been with the service for many years, others are new recruits, and the remainder sit somewhere in between. Almost all are friendly and very helpful. On the rare occasion when I have noted one who seems to be having a bad day, I simply feel sorry (and sometimes annoyed) that the driver can’t be more pleasant. So, if you sense a driver is being almost rude, simply ignore it and know that the next driver you get is likely to be a happier person. When you leave the bus you usually call out ‘Thanks’ as you step off. You do this regardless of which door on a long or short bus you leave by, or whether you are too far away for the driver to hear. To say thanks in this situation is not a law or a rule of any sort. Eye contact is not required. It is simply common usage and you do it whether the driver was friendly or not. You are recognising your journey was made safely (which it always is on the Metro buses) and are glad of it. I have not seen this gratefulness occurring anywhere else but here in the Greater Hobart Area. Derwent Valley Link operates a number of commuter bus services throughout the day during the week, and has a more restricted offering on weekends and public holidays, to and from Hobart. A limited service continues to some towns further west of New Norfolk. Their timetable is downloadable from their website at http://derwentvalleylink.com.au. On the occasions when I phoned for advice, their receptionist was very friendly, professional and welcoming. She told me that if I couldn’t walk the distance between Granton and New Norfolk and if I could find some part of the road where a bus could pull in and was able to describe that location, then I could phone and ask to be collected by a bus passing through. As it happened, I did not need that assistance and was able to walk to New Norfolk, locate the bus stop and catch a scheduled bus to return me to Hobart. In order to start another leg I took the bus from Hobart to New Norfolk; a simple and easy process. And cheap. I have travelled from Hobart to New Norfolk using this service and know the benefits of the trip from New Norfolk to Hobart. The bus stops to collect passengers in a few places as it leaves New Norfolk and then heads to Granton where, rather than continuing on the Brooker Highway, it follows the route which many Metro buses take in this area. That is, the Derwent Valley Link service takes the main road through Claremont to Glenorchy and then the main road through Moonah, New Town and North Hobart before its last stop at the intersection of Collins and Elizabeth Sts in Hobart. A passenger can press the stop button for any normal Metro bus stop along this route, and your bus will stop there and let you off. The bus does not travel between New Norfolk and Bushy Park on the Glenora Road, rather it travels on the Lyell Highway and therefore misses everything I saw as recorded in my posts. This means you cannot expect to hail the bus if you want to stop walking this leg where I walked. You pay the driver with cash, or a Greencard supplied by Metro Tas. If you have a concession card and can show it, the fare will be reduced. 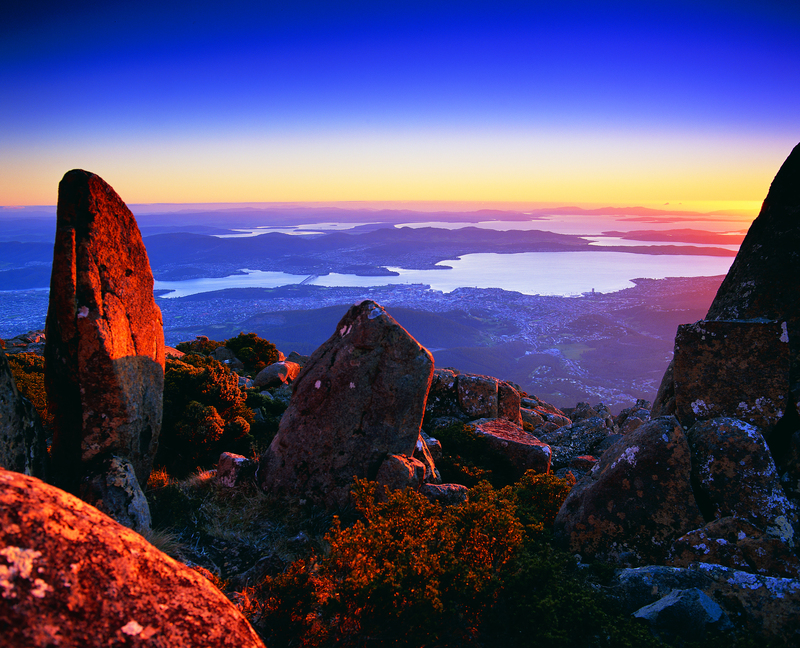 Four Tassie Link bus services each week (on Tuesday, Thursday, Friday and Sunday) link Hobart to the West Coast of Tasmania. In my l walk to Gretna, I used Tassie Link to return me to Hobart. I made a booking for the service that passed through this tiny town on a Friday night at 9.30 pm. Without a booking it is most doubtful the bus would stop because in Gretna the location was the roadside where no official bus stand or related buildings exist. In the darkness I cannot imagine a driver stopping under these circumstances. But with a booking, everything went smoothly and the trip back into Hobart was trouble free and comfortable. In relation to timing when to make a booking, Tassie Link receptionists explained that the drivers change over at Lake St Clair. That is, a bus leaves Queenstown while another bus leaves Hobart. They are scheduled to meet at Lake St Clair and the bus drivers change buses and return to their original start point. This means the latest that you can make your booking by phone is the time the drivers arrive at Lake St Clair. After that time the booking receptionist is unlikely to be able to reach the driver and alert him to the need to stop at particular towns – communication technology is limited along some of those roads because of the ‘interference’ from mountains. Unless you pay when you make a phone booking, you pay the driver with cash. If you have a concession card and can show it, the fare will be reduced. Really helpful information. Thank you for sharing. Do you know if they will allow bicycles on the buses? Hi Mark I am not sure about bikes on Hobart suburban buses. I use buses all the time but only have vague memories of a bike being on one. Most of the modern buses have one or two bays for prams and wheelchairs and so this is where a bike could stand. But whether it is permitted I am not sure – at peak hour in the morning and afternoon I think it would be impossible. But I dont know so I recommend you phone Metro on 13 22 01 in relation to Hobart buses. The bus to New Norfolk is the same style as the Metro buses – phone Derwent Valley Link on 03 6261 4653. Tassie Link buses, which take you west and north inland, may or may not be able to accommodate a bike depending on which style of bus they are using – contact them on 1300 300 520.
thank you very much most helpful. Hi Mark I have found all the bus services incredibly helpful. As you know I have been in awkward locations inland from Hobart – before walking in some areas, I phoned the Derwent Valley Link or Tassie Link (whichever was relevant to where I was walking), and I learnt more about their options and flexibility – with advance notice. I have been incredibly impressed because they were so supportive. Hi, can I ask for Tassielink do we tap our Greencard to pay or show the driver our Greencard to get 20% discount then pay in cash?